News - AMD Readies Ryzen 3 2200GE & Ryzen 5 2400GE APUs with Reduced TDP | Softoolstore - Самые интересные новости, обзоры технологий и софта. Overview of computer technology and the Internet. AMD is preparing to release low-power versions of its Ryzen APUs with built-in Radeon Vega graphics. The new Ryzen 3 2200GE and Ryzen 5 2400GE chips will have a 35 W TDP and will operate at lower frequencies when compared to the Ryzen 3 2200G and the Ryzen 5 2400G that hit the market this week. ASUS has already added support for the new energy-efficient APUs to BIOS of one of its AM4 motherboards, so the actual launch is imminent. AMD’s Ryzen 3 2200G with Radeon Vega 8 graphics as well as Ryzen 5 2400G with Radeon RX Vega 11 graphics have configurable TDP of 45 - 65 W and enable AMD to compete for mainstream desktops. This market is rather big and it is important to address it with competitive offerings, but sales of traditional desktops are stagnating at best. Meanwhile, demand for small form-factor desktops is growing, so AMD has to offer processors with reduced power consumption to address them. The company already has multiple energy-efficient Excavator-based APU for the AM4 platform in its arsenal and in the coming weeks or months it will release Zen-based APUs for SFF desktops. Initially, AMD plans to offer two energy-efficient Zen-based APUs: the Ryzen 3 2200GE and the Ryzen 5 2400GE. 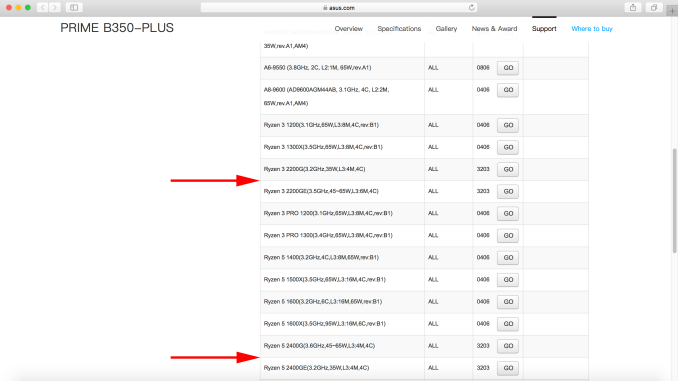 Both APUs feature four Zen cores as well as Radeon Vega graphics, but their exact specs and configs are yet to be disclosed. According to ASUS, the Ryzen 5 2400GE will feature four cores with SMT operating at 3.2 GHz (down from 3.6 GHz of the Ryzen 5 2400G) as well as a 35 W TDP. Meanwhile, the Ryzen 3 2200GE appears to feature four cores without SMT working at 3.2 GHz (down from 3.5 GHz of the 2200G) along with a 35 W TDP*. 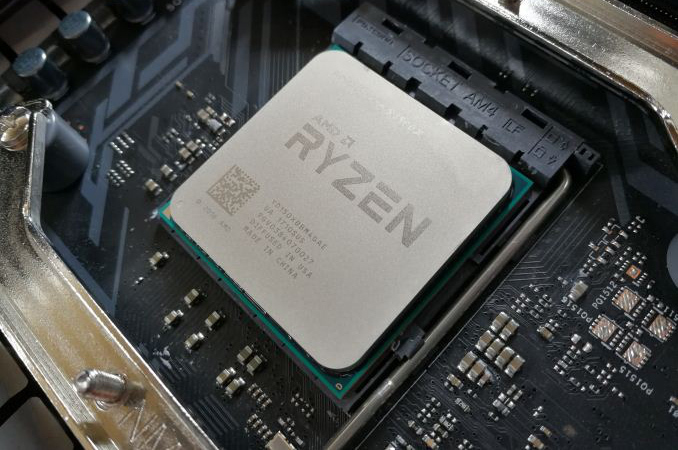 It remains to be seen whether AMD’s Ryzen 3 2200GE and Ryzen 5 2400GE sustain iGPU configurations of their higher-power brethren (obviously, at reduced clocks) as well as DDR4-2933 support, but at this point base CPU frequencies is all we know about these products. Turbo CPU Frequency 3.9 GHz ? 3.7 GHz ? Base GPU Frequency 1250 MHz ? 1100 MHz ? OPN PIB YD2400C4FBBOX ? YD2200C5FBBOX ? OPN Tray YD2400C5M4MFB ? YD2200C4M4MFB ? Price $169 ? $99 ? The 35W Ryzen APUs will enable AMD to compete for OEM SFF and ultra-slim Mini-ITX DIY builds (previous-gen Bristol Ridge chips were hardly attractive for enthusiasts), which will help the company to further increase its market share. AMD did not comment on the news story because the Ryzen 3 2200GE and the Ryzen 5 2400GE have not been announced, so we cannot fill the gaps when it comes to specs and prices of the new APUs. *Specifications of the Ryzen 3 2200GE are a bit less clear from the ASUS listings because the company attributes partially correct specs of the Ryzen 3 2200G (the L3 cache size the company cites is incorrect) to the 2200GE (see the image below). Now, if the company attributes specs of the 2200GE to the 2200G, then we have basic specifications of the former, but if there is a mistake somewhere, we do not and the 3.2 GHz base frequency figure is inaccurate.